Published by frgee on Wednesday, October 27, 2004 at 5:41 PM. Published by frgee on Monday, October 25, 2004 at 6:32 PM. 5 days of amoeba in the stomach might stunt my growth, but only time will tell. hopefully the little parasitical maniacs have all died and i can get back to jalapenos and hot sauce without the obligatory 9.8 second 100 meter sprint to the nearest outhouse. otherwise things are just fine down here. the christendom students left, and hopefully have arrived back in the states. the boys stayed up in a village and poured a cement floor, while the girls remained in banica and hung stations of the Cross in various chapels. another great visit from the kids from front royal. Published by frgee on Monday, October 18, 2004 at 2:53 PM. Published by frgee on Saturday, October 16, 2004 at 7:29 PM. have i really not blogged anything in 10 days? needless to say, it's been terribly busy here on the border: school is back in session, construction continues, scripture studies have begun, the youth group talks cranked up, and the days seem to pass with a general sense of joy. 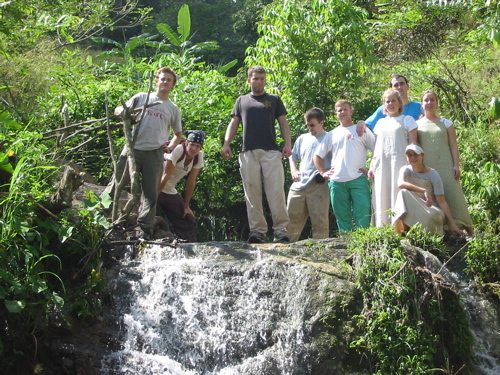 tomorrow i hope to take the students from christendom college up to the mountains to enjoy 60 baptisms. i'll see if i can't take a pic or two and post away. Published by frgee on Wednesday, October 06, 2004 at 9:41 PM. first day of school!! not everyone showed up, because i don't think they believed that we were actually going to start, even though we announced it. 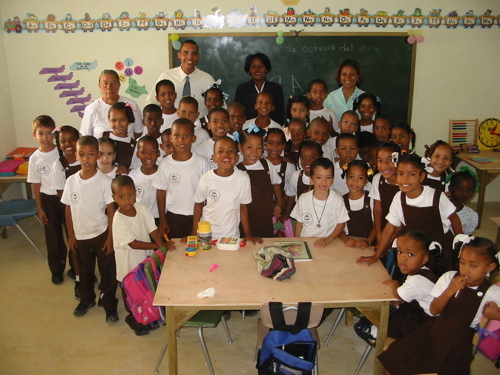 so here are the first through fourth graders with the teachers. there are another 22 kindergarters in the afternoon. notice the homemade desks and chalkboard. God bless all of you who contributed financially and spiritually to the building of the school. it's a miracle that we began fundraising in april, broke ground in june, and began class on oct 5th. Published by frgee on Sunday, October 03, 2004 at 6:02 AM. 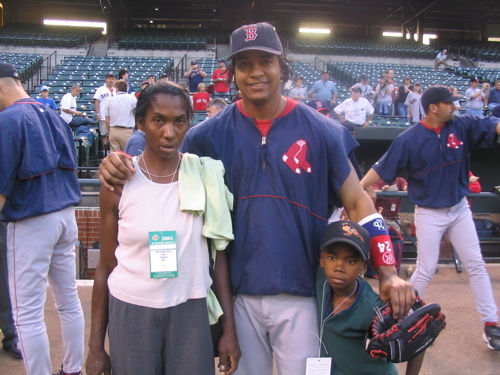 below you see three people: manny ramirez (dominican and all-star baseball player), petuta (mother of the young lad who didn't know her date of birth when i asked her), and william (her young son who has a hole in his heart that needs to be fixed). petuta and william have traveled to the states, accompanied by miss annie quast, to have his heart surgically repaired. what could be better than a little trip to camden yards to meet some domincan heroes? Published by frgee on Saturday, October 02, 2004 at 6:45 AM. we’re attempting to finish the school, which has included the building of about 50 desks, three chalkboards, painting chairs, and making 4 desks for the teachers. but we have almost finished. also, we hit a snag in the process when some knuckle-head stole my dewalt cordless drill (he didn’t, however, take the battery charger and extra battery which were sitting right next to it. a police investigation has begun). nevertheless, it looks like tuesday will be the day. also, we are in the midst of the annual “patronales” - the preparatory novena for the parish feast day, october 4th. in honor of said novena, i am preaching on a different aspect of st francis each night and hearing confessions. the church has been just about full every night for the novena, and last night the crowd was out the door. once fr murphy and i finish hearing confessions the people take up three huge bongo drums and parade through the street in front of the church. quite a thing to hear.